KERA’s One Crisis Away project focuses a spotlight on North Texans living on the financial edge both in weekly stories and regular in-depth series. A scene from West Dallas near Singleton Boulevard. A job loss, health emergency, even legal trouble can be enough to plunge a third of our friends and neighbors into financial distress. 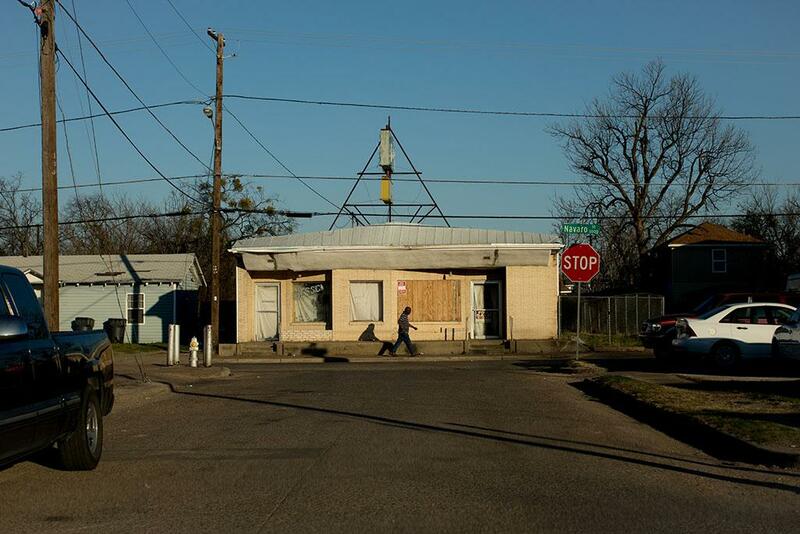 One Crisis Away puts a human face on asset poverty and the financial struggles of people in Dallas-Fort Worth. Explore multimedia projects: No Place To Go, a deep dive into affordable housing and gentrification in West Dallas; Rebuilding A Life, a series about North Texans recovering from devastating tornadoes; Drowning In Debt, stories about and resources for living with financial burden; and more. Opportunity zones are an effort to bring investors to struggling neighborhoods in exchange for tax benefits. There are thousands across the country, including 18 in Dallas County, seven in Tarrant and three in Denton County. Sandbranch, an unincorporated community in southeast Dallas County, doesn't have running water. And the man who fought so hard to change that, Pastor Eugene Keahey, was killed in a house fire. Elementary schoolers in Arlington donned hairnets and boxed up thousands of meals for hungry children Friday. The event benefits a nonprofit called Feed My Starving Children, which sends food to 100 countries. More than one in five Dallas children lives in poverty, while one in four Dallas families have a parent who was born in another country, a new study details. That's just two of the statistics detailed in the new "State of Texas Children" report from the Center for Public Policy Priorities. Austin is known as a city of renters — more than half of residents lease a place to live. And each day, a dozen Travis County families are evicted. Audrey McGlinchy of KUT decided to explore what happens when someone can no longer pay the rent, and got to know several people facing eviction. Accross the country the price of rent is leveling off, and in some places it's even dropping. A new report from Zillow shows that rents were up just half a percent in July, which appears to be the smallest gain for any month since 2012. Aaron Terrazas, a senior economist for Zillow, joined KERA to crunch the numbers. For the 17th straight year, the Communities Foundation of Texas mobilized volunteers across North Texas, hoping to commemorate the Sept. 11 terror attacks with hard work and compassion. In total, they tackled 27 service projects across the region. A North Texas nonprofit wants to bring services like food stamps and job assistance right to people's front doors. In March, the United Way of Tarrant County launched its mobile community center. Originally venturing out once a week, deployments were doubled in August.